Delhi gets first winter ice in 70 years, Indian cold toll soars. 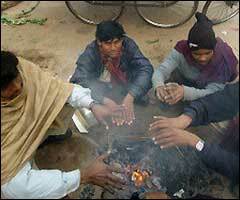 Indian vegetable vendors warm themselves by a roadside fire. NEW DELHI - The Indian capital Sunday saw its first winter frost in 70 years as a cold wave sweeping in from the Himalayas killed more people in northern India overnight, officials said. The capital city of 14 million people ordered schools shut for three days from Monday as the mercury for the first time since 1935 fell to 0.2 degrees Celsius (32.36 Fahrenheit), leaving mounds of ice on parked cars. READ ON.